Material Handling, & Machine control. UL listed Control panel builder (UL508A and Flame Controls). Electrical Engineering & AutoCad services for Factory Automation. Engraving Services | Installation Services. Control Panel Shop.with Automatied Control Systems Integrators Tools. Electrical Control Panel,Factory Automation, and Control Systems Integrator. "As Control Systems Integrators and Control Panel Builders; Tri-Tech Research applies Factory Automation experience to Develop Custom Control Systems." The the illustration above shows a 19" rack mount control package developed by Tri-Tech Research for one of our customers that requires repeat production of the same control package. The package is a custom control for dispensing Argon Gas between two layer of glass. The control uses a commercially available O2 sensor to detect the absence of O2. Thus completely filling the glass cavity with Argon. 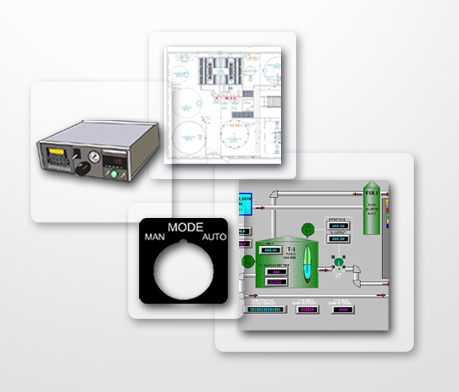 The Process control image is taken from one of our many custom Operator Interface screens.